I suppose most of us would be able to list a few things that we consider ourselves personally capable of. Maybe something like getting plants to grow or baking a great pie or remembering to mail off taxes on time or (like Cathryn) making pine needle baskets. But I suspect that there are things which we don’t recognize in ourselves that we are good at as well. It might take other people in our lives – those who know us well or perhaps even strangers – to point out that we have these other skills or talents. I thought of this the other day when Judy brought in a quilted wall hanging that she had made to show off a piece of Lynda’s handwork. Lynda would probably tell you that she is good at keeping things organized (great with paperwork) and knowing the names of birds and caring for her grandchildren. But she is also very good at making things. I remember when I first started quilting with the group and she brought in a lovely fish quilt that she had made for a child in her family. Recently at our annual rummage sale, I saw these sewn pieces on canvas (no idea what to call them) but the designs were amazing. Judy and I haggled over them because we both saw the wonder in them. Judy ended up with the small square one and I took an oblong one. 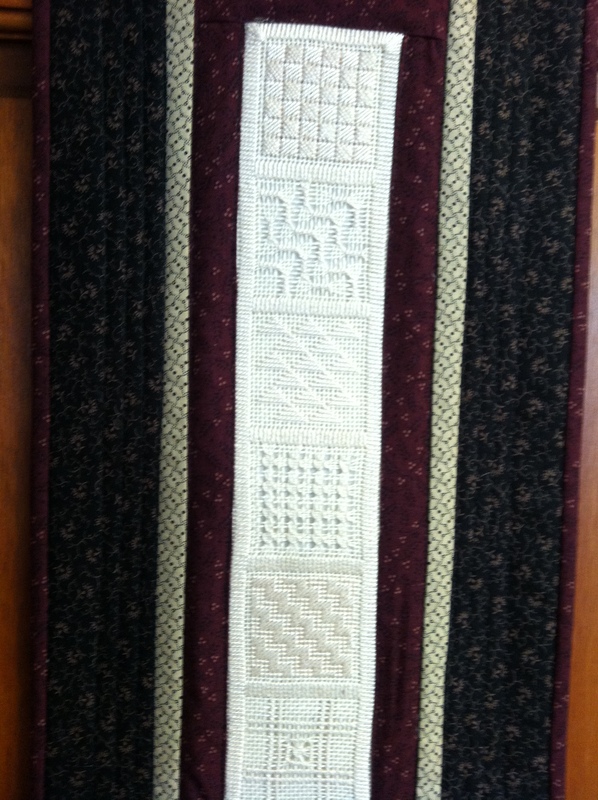 The next week Judy brought in the square one in the middle of a small quilted wall hanging that she had made. I gave her the oblong one and she magically transformed that as well. Now I have them both hanging in my office. Reminders that we are each capable of so much. And even when we don’t see the value in what we do, others might and it can add beauty to their lives. Is the lesson here not to underestimate ourselves? Perhaps – or it might be to put effort in everything we do because you never know when someone will thoroughly appreciate it. It can make a difference.